Greek coffee may refer to one of two different types of coffee that are popular in Greece. The first type is also known as Turkish coffee. To prepare it, roasted and finely ground coffee beans are boiled in a pot with or without sugar; the coffee is then served in a cup, in which the grounds are settled. Although the original term is Turkish coffee, in many languages it has been altered as a political euphemism, such as Greek coffee, Arabic coffee, Cypriot coffee, etc. In Greece, it was originally named “Turkish coffee” or simply “Turkish”, but political tension rose between the two countries during the 1960s. As a result, the name was changed from Turkish to Greek, especially after the Turkish invasion of Cyprus in 1974. The term Greek coffee may also refer to frappé or Greek frappé or café frappé. It is a foam – covered iced coffee drink made from instant coffee. It was invented in 1957 in the International Trade Fair of Thessaloniki. While the Greek representative of the Nestlé Company, Andreas Dritsas, was exhibiting a new chocolate beverage for children, which was produced by mixing it with milk and shaking it in a shaker, his employee Dimitris Vakondios, wanted to take his coffee break and enjoy his usual instant coffee. However, he could not find any hot water, so instead he used cold water and ice cubes and put the coffee in a shaker. The result was the extremely popular Greek beverage. It has been called the national coffee of Greece and is available in virtually any Greek café. 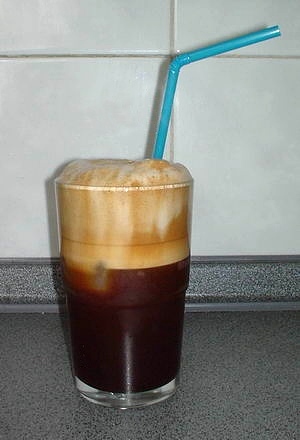 There are many variations of this coffee; milk and sugar may be added to taste; in another variation, milk may completely substitute water, a common Cypriot variation. One may also add Kahlua, Bailey’s Irish Cream or other types of liqueur; in some cafeterias, there is the option of adding a scoop of vanilla ice – cream on top of the coffee instead of milk.